Jatujak Market, also abbreviated as JJ Market, is the premier market in Thailand,and the largest in Southeast Asia. So you can’t stay in Bangkok, even if it’s just for a few days, and not visit it. Among its 8,000 stalls, you can find everything and more, starting with clothes, flowers, jewels, body care products, candles, statues, paintings and lots more. Jatujak is only open Saturday and Sunday from 9:00 a.m to 6:00 p.m. The little shops are divided into zones. At the main entrance to the market you’ll find a police station; there you can ask them for a map to see in which numbered zone you can find what you’re looking for. Some stands are also open on Friday night, such as a few restaurants inside the market from 9:00 p.m. to 3:00 a.m. Besides the official market, a little before the road that divides JJ and JJ Green, on the left, you’ll find the animal section. Let’s just say that Thailand isn’t a country where animals are treated well, and if you happen to enter into this area of the market, you’ll see this right away. They sell everything, from regular pets like cats and dogs to monkeys and even sharks. I suggest that you visit JJ early in the morning, before it gets too hot. The merchandise is displayed in small closets intended as stores, and everything is covered by a roof, so by noon the sun has really warmed up the market, and not being air-conditioned, you’ll die from the heat. Inside there are also restaurants, all Thai except for one that only makes Spanish paella, called Viva 8, located on the main road of section 8. You can’t miss it; follow the sound of the music that you’ll hear as soon as you enter and you’ll find Viva 8 easily. The paella isn’t anything special, the price is 150 THB a plate (very low! ), and the same owner also has a stall inside the Siam Paragon mall. If instead you enter in the west part (Kamphaeng Road), you’ll be in the clothing area (area 3) where there are several excellent Thai restaurants. Besides food and various objects, inside JJ there are also official exchange offices and cash machines to take out money run by local banks like Kasikorn or Bangkok Bank. There’s also the possibility of sending big or small packages abroad both with the Thai postal service or with international companies such as DHL. The JJ Market is located in the north of Bangkok, more precisely a few meters west of the “Mo Chit” SkyTrain stop. To get to the market you have a few options. The fastest is to take the BTS and get off at the Mo Chit station (exit 3). Depending on where you start you’ll pay a ticket price anywhere between 15 THB to a maximum of 52 THB. You can read our guide to getting around Bangkok here. If instead you’re in the northeastern part of the city, such as the area around Royal City Avenue, you can take the metro (also called the MRT), and get off at the Kamphaeng stop. The convenience of this station is that you stop right underneath the JJ, so once you take the escalator you’ll find yourself right inside the market. If you’d rather go in through the main gate, and first take a look at Jatujak Park, then stop at the first station: Jatujak Park. Another option is to take a bus. The buses that go to this market are numbers 3, 8, 26, 27, 28, 29, 34, 38, 39, 44, 52, 59, 63, 77, 90, 96, 104, 108, 112, 122, 134, 136, 138, 153, 159, and 510. Click here to read our guide to buses in Thailand. A taxi ride should be around 100 THB, remember to always ask the driver to turn on the meter. For those who stay or live in the areas around JJ, you can also take a moto-taxi. Personally I wouldn’t recommend it due to their being dangerous, but especially for the inflated prices they charge when they see you’re a Westerner. From the Ari BTS station, which is 2.5 kilometers from the market, a moto-taxi could even charge 200 THB. This is the night version of the JJ Market. Yet unlike the latter, JJ Green is open every evening, from Thursday to Sunday from 18:00 to 1:00. Inside you’ll find stalls that sell clothing, shoes, jewels, bags, and much more. There’s also an area where you can eat, and even a few bars where you can listen to live music and snack on something. The bar-restaurants inside JJ Green don’t serve particularly good food, they’re mainly places to go drink a few beers with friends. So I don’t recommend it if you’re going out for an actual dinner. The routes are the same as for JJ Market, with the difference that the entrance to JJ Green is situated a little more to the north than the one for Jatujak. If you’re right in front of the main entrance to Jatujak, in front of you you’ll see a park with the same nae, keep going to your left until you see an enormous parking lot: here it is, the beginning of the JJ Green Market. 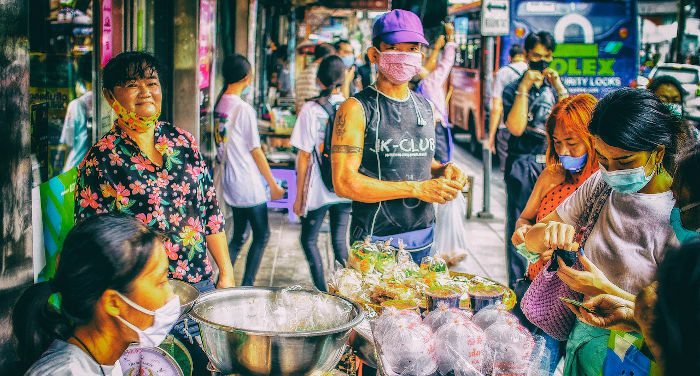 Since 2016 when the Thai government decided to chase off all the street vendors from the sidewalks of Bangkok, the arrangement of the Pratunam market also changed a lot. If before the stalls were also on the outside perimeter of the market, today they are all confined to the inside, near the Baiyoke Sky Hotel. At Pratunam you can find mid-to-low range merchandise, and many come to this market to buy clothing or shoes (all completely counterfeit) for a few Baht, to then resell them in other parts of the country. Just as with JJ Market, at Pratunam too you can haggle over prices, especially if you buy more than one. From Victory Monument you can easily get there on foot, first reaching Soi Rang Nam, then turning right on the main road called Ratchaprarop. Even from centrally-located Sukhumvit it is reachable on foot; after you arrive at the front of the Central World mall, you need to turn right following Ratchaprarop. Still going straight you’ll see the Pratunam market. With the SkyTrain you’ll have to get off at the stop called Chit Lom, and then take the same route on foot as you would coming from Sukhumvit, as was just described. A few buses go by Pratunam, whether you’re in the north or south of the city, they are the 74, 77, and 510. The stop for getting on or off is found right at one of the main entrances of the market. Like all markets in Bangkok, Pratunam too can be reached by taxi or moto-taxi. I don’t recommend that you take a taxi, since Ratchaprarop is a heavily-trafficked road, especially due to its vicinity to the center of the city. You’ll only risk wasting time and paying a much higher price. Pathpong is an open-air market held every evening, from 6:00 p.m. to 1:00 a.m. The products on display are quite often counterfeit, such as watches, sunglasses, shoes, or sport shirts. There are also stalls selling souvenirs, and a few where you can buy local handicrafts. Like Pratunam this market doesn’t offer anything special in terms of quality or distinctiveness of the merchandise. The best part is the location; being located in the gay section of the city, you can find bars and restaurants with shows an live music. Pathpong, like JJ and Pratunam, is also located near a BTS stop: Sala Daeng. Once off the train take the stairs to your right (looking towards the south of the city), and keep walking for a few hundred meters along the main road. At a certain point you’ll see a road full of European restaurants on your right (the Spanish on 4 is excellent), keep going straight (without going down the road with the restaurants) and after a few meters you’ll see the Pathpong market on your right. With the metro, get off at the Silom stop, follow the tracks of the elevated BTS to the Sala Daeng stop, located a few meters away, and from there walk to the market. Sadly, as with almost all the tourist and happening night spots (other examples are Nana and Asoke), finding a taxi willing to turn on the meter is quite tiresome, because the drivers want to earn as much as possible from tourists. Finding a taxi for or from Pathpong isn’t however impossible, and if you’re around Sukhumvit a trip will cost about 100 THB. Among the buses that go past this part of the city are the 15, 16, 76, 77, 504, 514. Up until 2016 this market was located a few kilometers outside the center of Bangkok, on the eastern periphery of the city. Starting with last year it was however decided to move it to an area more accessible by public transport. Before it was moved to a spot along the metro line, the train market was located along Srinakarin Soi 51. Today it’s located a few meters from the Cultural Centre metro station. It was called the Train Market because before being moved to Srinakarin, this market was held at the Mo Chit train station. Due to the enlargement of the SkyTrain line in Bangkok, it was necessary to move it to another part of the city. The market is open from Thursday to Sunday, from 18:00 to midnight. Inside you can find handmade clothing, vinyl, clothing and vintage accessories of all types. There’s also no shortage of local foods like Pad Thai or Roti. The easiest way it to take the metro and get off at the “Cultural Centre” station. In fact there aren’t any SkyTrain stations that go by this part of the city. Besides the MRT you can take a taxi or a bus. The most popular is 514. Khao San Road is the backpacker street in Bangkok. There you can find restaurants, hostels and shops offering goods and services at low cost. Day and night Khao San is alive with young tourists looking for entertainment. The various shops located on both sides of the street sell t-shirts, pants, bathing suits and various souvenirs. In my opinion there’s nothing there worth buying, or going to this part of the city to buy. The first option is to take the metro to the last stop Hualamphong and then take a tuk-tuk or taxi. Taking a taxi directly from the middle of the city can cost you around 100-120 THB. I don’t recommend that you take a tuk-tuk from the center, especially those stationed in front of the Siam Paragon (the worst! ), that will charge astronomical prices. If instead you want to take the trip entirely with public transport, you can take buses numbers 2,15, 44, 47, 59 (also a night bus), 60, 70, 79, 157, 159, 171, 183, 201, 509, and 511. All these buses, both from the center of Bangkok to Khao San Road and vice versa, stop at the main street that skirts the smaller Khao San Road, where there’s the democracy monument (Ratchadamnoen Klang Road). The buses that stop on the other side, on Phra Athit, the road that hugs Khao San Road vertically near the banks of the river, are number 2 (also a night bus), 15, 53, 524. Let’s now talk about the city’s big malls. Not being located in tourist areas the price of goods, including restaurants and the cinema, are much lower than in the center. Since many shops inside are just stalls in pure market style, you can negotiate prices, something you absolutely can’t do in the Siam Paragon, for example. There’s lots of people and you’ll have the chance to find a seat in one of the restaurants or cafes located on the ground floor. The only restaurant where you’ll have to wait a minimum of 20 minutes, is Eat Am Are. This Steak House restaurant chain, has had so much success in the last two years that from just one restaurant they’ve gone on to open 5, all located in the area of Victory Monument. Eat Am Are is especially favored among the youth; a giant mixed salad costs just 69 THB, a dish with steak, fries, bread, and salad, 129 THB. Each day around 6:00 p.m., night markets are set up in front of these three malls (they’re separated by just 600 meters), where you can get excellent local food, as well as various handmade objects (from bags to earrings). The best in my opinion is the Century Movie Plaza. Inside you can find a few excellent Italian, Thai and even Japanese restaurants. On floor -1 you can also shop at the Tops supermarket, or eat Thai food for just a few Baht. On the ground and first floors there are stores of various types, such as clothes and accessories, and on the second floor you can find banks and a bookstore. On the last floor there’s the Eat Am Are restaurant that I just spoke about, a hair salon, a gaming hall and the cinema’s ticket booth. The theaters themselves are located on the fourth floor. The Century Movie Plaza is practically attached to the Victory Monument BTS station. This means that once you get off the train and go through ticket control, take the exit on the left and you’ll see a footbridge that goes right into the first floor of the mall. If you’d rather go to Center One, all you have to do is take the elevated gangway on the left. Once you get to the Victory Monument roundabout on your right you’ll see a footbridge and stairs going down. Underneath there is the entrance to the mall, right by the McDonald’s restaurant. The same route applies for the Victory Mall, which is just before Center One, and crossing a footbridge you can go right into the first floor of the mall. Almost all buses in the city go by Victory Monument, which could be considered the largest road hub in all of Thailand. If you take a taxi or a tuk-tuk, depending on the mall you want to visit, you’ll have to give a different direction to your driver. For Center One andl Victory Mall you can tell the driver “Victory Monument BTS”; for the Century Movie Plaza instead you need to say Rang Nam, because it’s located right at the start of this road, otherwise they’ll drop you off at the Victory Monument roundabout, close to the other two malls. MBK opened in 1986, and is one of the most visited malls by both tourists and locals. Inside you can find some of everything for more than reasonable prices, especially when compared to Siam Paragon or Central World. MBK is open 7 days a week, 365 days a year, from 10:00 a.m. to 10:00 p.m., and covers an area of about 90,000 square meters. There’s a good 2,000 stores inside, distributed over seven floors. The first floors are reserved for clothing, souvenirs, shoes, body care products, jewelry, massage centers, hair salons, and also food stores like the Tops chain. The majority of merchandise sold is counterfeit, you can find Converse shoes for 1,000 THB, and Puma t-shirts for 300 THB. The middle floors are dedicated to technology. They sell computers, cell phones, iPads, cameras, and all gadgets you can imagine. Here too the majority of goods are fake. The last floors offer decor, refreshments (both large international chains like Starbucks, Fuji, and Pizza Pizza, and the so-called food court), and on the seventh floor there’s the cinema’s ticket booth and bowling (a game costs 120 THB a person, and on Wednesday it’s half price for all). Inside the MBK there are two food courts, one serving local food is located on the sixth floor, the other is on the seventh floor and serves international foods (Japanese, Indian, Italian, Greek, Mexican, Vietnamese). The difference of the food courts is that inside a closed area you can have different cuisines, where you can see how they prepare the food since it’s all open. To pay you use a ticket, which you’ll have to show at the exit of the food court to settle your bill. The prices at the food courts (especially at the international one) aren’t all that great, in addition you have to pay the IVA, which in Bangkok restaurants is usually 7% plus a service charge of 10%. The food isn’t terribly good; if you’d like to eat something light for a good value, I recommend the Sushi Boy restaurant, located in front of the escalators on the seventh floor. You can take the SkyTrain and get off at the National Stadium stop. At this stop there’s a footbridge that connects the mall with the BTS, and once you go inside you’ll be on the first floor of a large department store: clothing department. If you’re already in the area, such as at Central Word or Siam Paragon, and want to take a walk, you can just follow the elevated train line (west direction) and when you get to the curve, you’ll see the immense MBK on your left. The mall is also easily reached by taxi. Pay attention though when you want to go from the MBK to somewhere else in the city, since the taxis that you see lined up in front of you on the main road can’t take passengers since there are specific areas for this type of service. Despite this directive, many taxis and tuk-tuks still seek to find clients. If though the police should see a driver take passengers in this way, he’ll get a ticket; and you too will have to pay a penalty. When referring to the Siam Paragon, Siam Centre and Siam Discovery are also included; two malls located a few hundred meters apart. The Siam Paragon is the third largest mall in the country, and is considered to be the center of Bangkok. It’s open all year round, from 10:00 to 22:00. Inside you can find luxury stores of all types: Dolce & Gabbana, Dior, Armani, and brands for everyone like Zara or H & M. But you can also admire up close luxury cars like Ferrari, Lamborghini, Lotus, and Maserati. As with all other malls in the city, the Siam Paragon (the Siam Center and Siam Discovery have only clothes and restaurants) also has a bowling alley and the inevitable movie theater. The Enigma Theater is one of the most luxurious in the country; for 3,000 THB you can eat dinner and enjoy the film while seated on comfortable couches. Besides the Enigma there’s also regular theaters, those in 3D, those in 4D, for a total of 16 theaters. On floor -1 you can find lots of restaurants and an enormous food store. The selection is very large and you can go to cheap places like McDonald’s, KFC, Subway, or very-refined Japanese restaurants. On the same floor you can also find the largest aquarium in Southeast Asia: Sea Life Bangkok Ocean World. The price of a foreign adult ticket is 1000 THB, children pay 800. For Thais the prices are: 490 THB and 350 THB. The famous Madame Tussauds wax museum is located inside Siam Discovery. Entrance costs about 800 THB, and hours of operation are from 10:00 to 21:00. Getting off at the “Siam” SkyTrain stop, you can get into the mall via two walkways, one to the east (which goes to the first floor entrance), and one to the west where you come out in front of the mall’s square, where on the right there’s a staircase with palms and artificial waterfalls. As one of the busiest parts of the city, taking a taxi for Siam is a nightmare. The traffic on this route on the Sukhumvit line is heavy at all times of day. I also don’t recommend that you take a taxi or tuk-tuk from Siam to some other part of the city, because taxis never use their meters, and just to go a kilometer it will cost you 300 THB. Don’t even talk about the tuk-tuks; the worst are those parked in front of the Siam Paragon. If you’d rather get around by bus, the lines that go past these three malls are the 79 (headed for Khao San Road), the 54 (goes more to the north, in the JJ market area), the 40, 48, 501, 508 go along Sukhumvit until Asoke. The largest mall in Thailand, and the tenth largest in the world, is Central World. It’s one of the most beautiful and functional shopping malls you’ve ever seen; consider that inside they even hold concerts and events like fashion shows or film presentations. In the middle part there are banks, hairdressers, shops of all sorts, jewelers, bookstores, a supermarket (on the seventh floor), restaurants and cafes of all sorts (on the sixth and seventh floor), cinema (on the seventh floor) and even a skating rink and beauty clinics. In the east wing there are four floors of the famous Japanese chain Isetan. Inside you can find perfume shops, jewelry stores, appliances, clothing, home goods, several Japanese restaurants, and even a supermarket. In the west tower, besides the Sky bar (called CRU) on the 55th floor, there are international schools like the SAE Institute, gyms, beauty centers, saunas and massage parlors. The first seven floors are occupied by the Zen chain. Inside you can buy clothes, bags, shoes, jewels, souvenirs, appliances, and lots more. Next to Central World, still in the western part, you can find the Groove zone, full of international and local restaurants, and even breweries with hundreds of imported beers from all around the world. Central World is located between two Skytrain stops: Siam and Chit Lom. If for example your at Ekkamai it’s better to get off at the Chit Lom station which is closer and you’ll pay less for the ticket. Vice versa, if you’re closer to the Siam stop. Located in a central area, this mall can be reached from anywhere in Bangkok. On the east wing there’s also a bus stop, where there are various means of transportation headed to the north (such as the 74 and 77), to the southwest (204), and even the southeast (513). Like Siam Center, in this area too I strongly don’t recommend that you take a taxi or tuk-tuk. The distinction of Terminal 21 is that it’s laid out like an airport: there’s a screen with fake departures, and each floor has the name of a city. The London floor, for example, has a red phone booth and a small model of an English bus. Inside you’ll find clothing stores like H & M, and also smaller shops offering products from local emerging stylists. On the top floor you’ll find the cinema, while the second to last floor has a large selection of international stores. A great restaurant (that doesn’t cost much) is the Chinese restaurant Tim Ho Wan, winner of a Michelin star. If you’d prefer meat, I recommend the Argentinian restaurant El Gaucho, located just outside of the malls. Unlike malls such as Siam or Central World, Terminal 21 has less luxury stores, but more original products and brands. Terminal 21 is situated in another of the more important and busiest areas of the city: Asoke. This characteristic makes it well connected to the rest of the city, since there’s a SkyTrain stop of the same name, from which you’ll have direct access to the first floor of the mall. There’s also a metro stop a few meters away, called Sukhumvit. Among the buses that pass by this area of the city are the 513 (going north) and the 508 (which goes as far as the Royal Palace). Getting there by taxi isn’t possible, but be prepared to sit in traffic for a while. There are more malls in Bangkok than those listed. In this article I wanted to tell you a little about the most famous and popular among tourists and local expats. Depending on the category you belong to, you’ll be sure to find a mall to your liking, such as the mega-center in Bang Na where there’s an Ikea, or the mall at the Ekkamai station, where you can bowl on Saturday night, or Pantip Plaza (recently moved inside the Palladium), the best shopping mall for technological gadgets, to finish with the one in Lat Prao, where they sell articles for making tea.